Cape Town, South Africa—On Monday, October 23, the U.S. Energy Association, along with the U.S. Energy Department’s Office of International Affairs, and Office of Fossil Energy, will help kick off Africa Oil Week by releasing a new version of its LNG handbook designed to help Sub-Saharan Africa develop its natural gas resources and LNG projects. The handbook, Understanding Natural Gas & LNG Options, is a guide, crafted over the past two years by dozens of technical and legal experts from the government and private sector, for policymakers and companies to help develop Sub-Saharan natural gas resources, expand critical infrastructure necessary to increase access to electricity, drive industrial activity and economic growth. The U.S. Agency for International Development funded the project through the Power Africa Initiative. 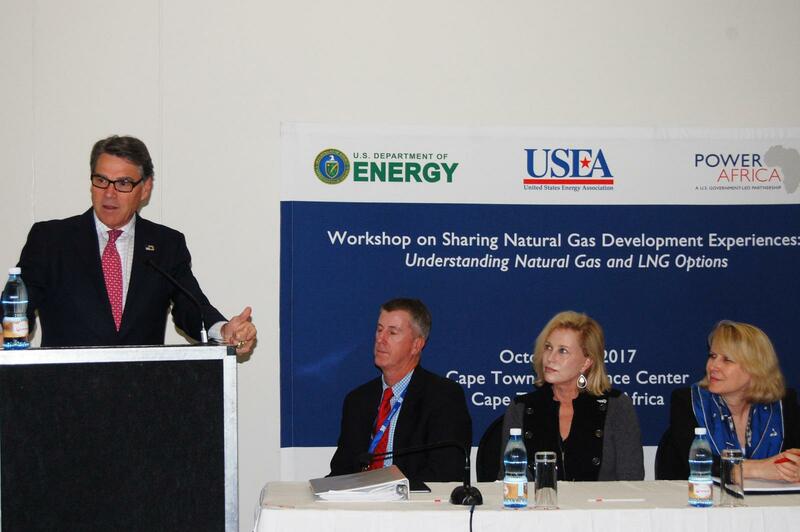 In a workshop in Cape Town on Monday, U.S. and African government and industry stakeholders will discuss the handbook, financing and implementation challenges associated with new natural gas and LNG-to-power projects, and policies and regulations that have enabled successful LNG projects. U.S. Energy Secretary Rick Perry will make remarks during the workshop. Officials from Mozambique, Nigeria and Cote D’Ivoire, among other key LNG stakeholders, will also make presentations Monday. “I look forward to working discussions with our allies in South Africa and across the continent to advance mutually beneficial safe and sustainable energy development,” he said. “Working together, our team of experts at USEA, DOE and USAID have created a roadmap for prosperity for Sub-Saharan African countries otherwise struggling to grow economically and meet their own energy needs. If the countries can produce their natural gas and export it, they’ll draw investment, and they’ll build their infrastructure and improve their economies,” Worthington said. The handbook outlines technical, commercial, and economic factors the African countries should consider when producing and exporting the continent’s most abundant energy resource—natural gas. It could spur significant investment in Africa’s gas and power sectors and open a market for U.S. manufacturing and technology. “LNG exports are poised to be an important catalyst for economic growth in African countries. Natural gas and LNG development can enable economic development and stimulate further investment in national infrastructure,” the authors wrote in the handbook. If you would like to speak with USEA Executive Director, Barry Worthington, please contact, Dipka Bhambhani at [email protected] or 202-321-3337.